The right amount and variety of bird cage perches is essential to your bird’s foot health and cage “furniture”. Providing your bird with perches of various types and diameters is absolutely essential. Your bird will spend most of his life standing, so preventing foot problems is very important. Bird cage perches of different types and diameters help to exercise your bird’s feet so he won’t get tired of standing on same-sized perches of the same material. Perches will also help your bird navigate his cage and have comfortable places to sleep and spend his time. Bird cage perches come in all shapes, sizes, materials, and colors. It is important to have a variety and know what a variety looks like. There are also bird cage perches that are recommended against and even poisonous, so it’s important to know what to look for. There is a recommended perch diameter for each size bird. This is so you don’t choose bird cage perches that are too big or too small for your bird. It’s important to have perches that are the right size for your bird as well as perches that are a little bigger and a little smaller than the recommended size to give your bird the size variety that he needs. There are a few different popular types of parrot perches on the market. However, you do not need them all and some of them aren’t good for your bird. Below is a table with the recommended quantity of the different types of perches. Keep in mind that different diameters are required too. Therapeutic perches help trim your bird’s nails and may lead to a reduced need for nail trimmings. Try to place one as the highest perch in the cage or near your bird’s favorite food dish–this will help make sure it gets used. Natural wood perches are the best perches for your bird’s cage. Not only do they offer different diameters for your bird’s feet, but they are also good for your bird to chew. Rope perches are also a great addition to a cage. They provide a different, softer surface as well as a different size for your bird’s feet. Yes, there are such things as heated perches. These perches are used to help regulate your bird’s body temperature and comfort. Shower perches can be very fun for a bird that likes to spend time with you in the shower. Wooden dowel perches usually come with a cage and are cheap and easy to clean, but do not provide the size variety that your bird needs. It’s ok to use one as long as there are other types of perches in your bird’s cage. It’s important not to overcrowd your bird’s cage with perches. He should still be able to spread his wings without hitting a perch. We know perch hunting isn’t easy, so we’ve done the hard work for you and have found the best parrot perches on the market at the best prices and with the largest variety for each type of bird. Therapeutic perches are a must-have for any bird. They trim nails, are safe for beak rubbing, and many come with varying diameters. Use for Medium birds: Caiques, Lorikeets, Pionus, Poicephalus, etc. Natural wood perches are required in every bird cage. They offer natural varying diameters and give the birds a perch closer to the ones available in their natural habitats. Make sure to provide your bird with at least one of these perches. Rope perches are a must-have for any bird. They are soft, comfortable, durable, and most importantly, different. The various lengths available also make these perches fit any size cage and even stretch all the way across the larger ones. Heated perches really are a lot of fun and many birds absolutely love them. And on top of that, heated perches protect birds from the negative effects of air conditioning and heat lamps. This perch comes in three different sizes, so it can be used with any bird. Use for Medium and Large birds: Caiques, Lorikeets, Pionus, Poicephalus, African Greys, Amazons, Small Cockatoos, Eclectus, etc. Shower perches are great for pet birds. All parrots from the tropical rainforest spend half of their active time grooming and bathing, and the other half is spent foraging for food. Showers are an important and healthy part of their daily activities. These perches can give your bird back the thrill of the tropical rainforest in your shower. 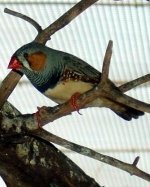 Use for X-Small, Small, and Medium birds: Finches, Canaries, Cockatiels, Parakeets, Caiques, Lorikeets, Pionus, Poicephalus, etc. We hope we’ve helped you find the best bird cage perches for your pet bird! Have You Found A Favorite Perch? Share it here! There’s no better way to learn about the best pet bird supplies than from the owners themselves. Your comment may just help someone find a perch their bird would love! MEDICAL DISCLOSURE: The information at allpetbirds.com has not been prepared, endorsed, or reviewed by any form of certified bird expert or licensed veterinary professional. Nothing on the this website should be taken as medical advice, but instead should act as a useful resource in providing general information that may be useful to members of the general public. All visitors are encouraged to consult with a certified expert or licensed veterinarian for accuracy or any form of pet safety or medical advice. PHOTO CREDITS: Images on this site are royalty-free, in the public domain, or under a Creative Commons license and are free to use on web sites and other projects. Please see the Photo Credits page for more information. PAID ENDORSEMENT DISCLOSURE: We are grateful to be of service and bring you content free of charge for your information and benefit. In order for us to do this, please note that whenever you click on the links in this website and purchase items, (in many but not all cases) we will receive a referral commission. However, this commission does not influence the information we provide in this site. We always give honest opinions and reviews to share our findings, beliefs, and/or experiences. 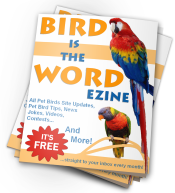 Get access to pet bird tips, news, jokes, contests, site updates, and more!